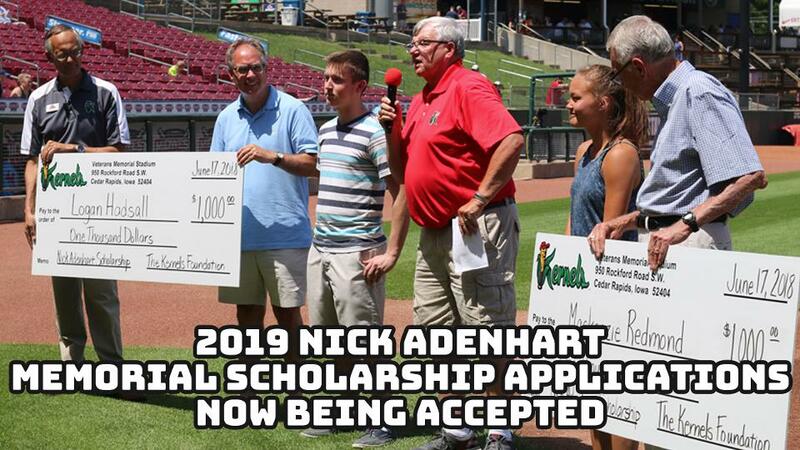 Cedar Rapids, IA - Applications are being accepted through The Kernels Foundation for the ninth annual Nick Adenhart Memorial Scholarship. Nick Adenhart was a bright young pitcher who played for the Cedar Rapids Kernels in 2006, and was a rising star in the Los Angeles Angels organization. Only hours after Nick's 2009 season debut on the mound for the Angels, a drunk driver tragically killed him on April 9, 2009 at age 22. Nick's family and the Kernels Foundation would like to honor him by awarding two $1,000 scholarships in his memory. The Kernels Foundation is privileged to administer the scholarship on behalf of Nick's family. The deadline for submitting applications for this scholarship is Friday, April 12, 2019. Applicants must be a graduating high school senior from an area high school and attend a two or four-year accredited college or university and take 12 or more hours per semester. The applicant must have played an organized sport in the last two years, must be a great teammate, must demonstrate hard work and determination, and must have a clear vision of their career goal. Scholarship applications are available through area schools guidance offices. An information packet, including the application form may be downloaded by clicking here. For more information, please contact Doug Nelson at 319-363-3887 or email at doug@kernels.com. 2019 season ticket packages and 10-game coupon books are on sale now at the stadium, or by calling the Kernels at (319) 363-3887. Individual game tickets go on sale Monday, March 18th at 10 AM. The Kernels open the 2019 Midwest League season at home on Thursday, April 4th vs. Peoria at 6:35 PM.